Standard brackets - we have just made another batch of these which are identical in design to the original. Note the correct folding on the thread block retaining clips, as also shown on the photo in the original J2 manual. 1. Provides for easy removal of the camshaft without the need to either remove the radiator or the cylinder head. 2. Helps reduce oil splash which sometimes finds its way out of the rocker cover top vents and also helps redirect oil back onto the cam and fingers. 3. Enhances rigidity of the camstands. Supplied in stainless and excludes rocker knobs. Extra long 1/4 BSF camshaft bearing cap studs and spacer washers of 5/16 inch depth need to be used with this part. Deeper spacer washers need to be used when fitting the VMGP special single securing bracket for use with the large J camshaft conversion. 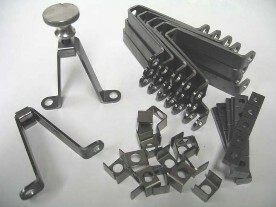 Either single bracket is to be used in conjunction with our rocker shaft intermediate supports. Please note that the plate shown left above is to be used with the standard factory camshaft whilst the plate on the right is for use with the large cam. 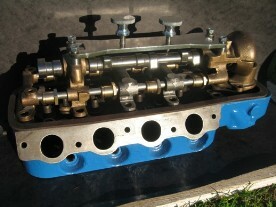 The main difference (apart from the extended rear splash guard) is that the hole centres are wider to accommodate the studs from the camshaft caps.